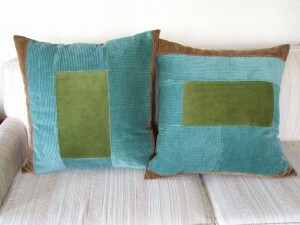 #1 Large pillows from corduroy scraps. These are a big hit in our living room due to their generous size! 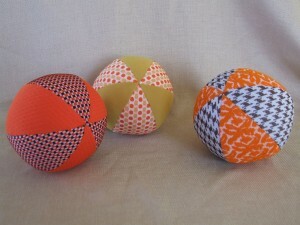 #2 A set of 3 balls for baby Morgan’s baby shower. He is 4 months old now, and quite a charmer! 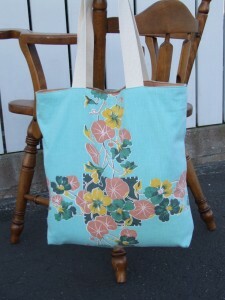 #3 An end-of-the-year thank you gift for Owen’s amazing second-grade teacher: a tote made from a vintage tablecloth with a beautiful nasturtium motif. #4 Made 3 of these sturdy market totes from this odd painted-canvass-like fabric my neighbor picked up for me at a yard sale. I like it that when people see outrageous fabric, they think of me. #5 Finally finished the second of 2 purses commissioned by my friend, Nikki, who was very patient, thank you. Did my first zippered pocket (on back) which was exciting to learn. I used this tutorial from U-Handbag. And that wraps up the spring craft update. 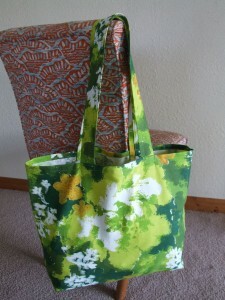 I especially love the green tie dye like tote. Love it that you are always challenging yourself (zippered pocket on bag). I love the blue green pillows. The older entry with the pictures of the monkeys made our whole family giggle. Those are awesome. You are so creative!